1. Why should I listen to this story? 3. Who is the main character and what did they want? 4. Who or what is getting in the way? 5. What did they do about it? 6. How did it turn out in the end? 7. What did you learn from the story? 8. What do you think I should go do now? For more on storytelling, check out Episode 91 of The TalentGrow Show with Ryan Williams! TEASER CLIP: Paul: That’s what art does. It emotionally moves people. Now, when you’re telling a story, the same thing, if you tell a good story, the same thing is going to happen. The key thing is you want to make sure that that emotional manipulation is welcomed by the audience. The people in that symphony orchestra hall and the theater want their emotions manipulated. If you’re telling some sappy story to con somebody into buying something they don’t need with money they don’t have, they probably don’t welcome that emotional manipulation, so the first thing you’ve got to make sure you’re doing is make sure your purpose in telling the story is to benefit the audience, and not you. Halelly: Welcome back to the TalentGrow Show. This is Halelly Azulay here, your host at TalentGrow, and I’m looking forward to sharing today’s guest with you. He is an expert on storytelling, and I know that that’s a topic that we’ve covered recently and it’s something that’s coming up so much that I thought I’d bring you another angle to this idea. So Paul Smith is our guest, and with him, we talk about why you should think about storytelling as a key and powerful business tool. We talk about how to avoid being manipulative, and use storytelling only for things that create a positive, a win-win outcome, not something that actually takes advantage of people. He talks about how to tap into emotions without crossing over that potentially very fuzzy line. And he even shares with us the structure of a great story with eight questions that you need to ask yourself in order to build a story that will be effective as a leader. I hope that you will enjoy this episode. I would love your feedback afterward in the comments section of the show notes page. Without further ado, here we go with Paul Smith. Okay, TalentGrowers. I am here with Paul Smith. He is former director of Consumer and Communications Research at Proctor and Gamble, now one of the world’s leading experts in business storytelling. His work has been featured on the Wall Street Journal, Fast Company, Inc. magazine, Times, Forbes and Success magazine, among others. He is named one of Inc. magazine’s top 100 leadership speakers of 2018. That’s very cool. Clients have included Google, Hewlett Packard, Bayar Medical, Ford Motor Company, Oracle and others, and he is the best-selling author of three books, Lead With a Story, Parenting With a Story and Sell With a Story. Paul, welcome to the TalentGrow Show. Paul: Halelly, thanks very much for having me on. I’m happy to be here. Halelly: I am also happy that you are here, because this is a topic that is really an important one and maybe a buzz lately. People talk about it more and more, but I think still the mainstream leader and/or person who is preparing themselves for a leadership role might not necessarily know that they need storytelling as an art or a skillset. So we’re going to talk more about that. Before we do, we always ask the guests to describe their professional journey briefly. Where did you start and how did you get to where you are today? Paul: I had a fairly typical corporate career path up until about five years ago. I spent a couple of years at Accenture as a consultant, and then as you mentioned, Proctor and Gamble. I spent 20 years there, in various leadership roles. Along the way, I became fascinated with this topic of storytelling. Part of it was because I didn’t feel like I did it very well, but more importantly, just as I became aware of the leaders that I admired the most were really good at it, and they didn’t teach me that in business school. They didn't teach me that when I joined the companies I worked for and so I kind of became fascinated with it and wanted to learn how to do it, but didn’t know how to learn about it. I ended up interviewing, gosh, I’m up to like 250 or 300 CEOs and executives at companies all over the world, and like 25 countries around the world. Just on my own personal learning journey, and along the way I kind of realized that if I’m so interested in this topic, maybe other people are as well. So it stopped just being my own personal learning journey and became an idea for a book. One thing leads to another and then the book comes out and I find myself in a new career path, writing books and teaching people how to be better leaders through storytelling. It wasn’t where I thought I would end up in my career when I started out, but I’m so happy that I ended up here because I absolutely love it. Halelly: So neat. I really actually love to expose the TalentGrowers to this idea of starting something that’s more of a passion project or a side hustle, and where it can lead. You don’t know where it might lead, but I think it enriches you as a professional and really raises your value, plus your satisfaction. So you started doing those interviews while you were employed? Halelly: Neat. And you weren’t sure why you were doing it? Or did you have a book in mind? Paul: The book idea came into being pretty early in the process. One thing I did know was that while I liked my job, I didn’t love my job. And I wanted to do something that I loved. I mean, who wouldn’t, right? Wouldn’t it be great to find something you love and figure out a way to get paid for it, and turn your side hustle into a main hustle, right? What I knew I loved was I loved speaking to audiences and teaching and training leaders, but there’s no full time job for that at P&G, or most other companies. If I wanted to do that full time, what I realized was the people that get to do that full time are typically people who’ve got some best selling book on some specific niche topic that they’re an expert on, and so I thought, “Well, that’s the thing I’m going to go be an expert on,” storytelling. Halelly: I love it. I think that’s a great lesson for everyone to hear – take initiative and create your own career. I’ve had several other guests who have described a similar thing they did. They did it differently, but a similar idea of doing something I’m passionate about, and build it as I’m in the job, and then later it can become something that I do. So you have three different books as I mentioned, but the one that we’re going to focus on is the one that’s on using stories for leadership. In that book, called Lead With a Story, you say that whether you’re trying to communicate a vision, sell an idea or inspire commitment, storytelling is a powerful business tool that can mean the difference between mediocre results and phenomenal success. I would love to sell us a little bit more on that idea. If listeners are sitting there kind of on the edge, or on the fence, about whether storytelling is a legit skill for leaders, why should they reconsider or really consider it? Paul: I admit that at first, it doesn’t sound like a legitimate business skill that one should need to have, but I’m convinced that it is, and a significant amount of research suggests that it is. But I’ll give you my top three or four reasons. First of all, the cognitive science over the last couple of decades tells us that human beings don’t make the rational, logical decisions that we think we make. Turns out that decisions are made in this subconscious, emotional part of the brain, and then rationalized a few nanoseconds later in a more conscious, logical processing part of the brain. We leave a decision thinking that we’ve made it for these logical, rational reasons, but the truth is those are just rationalizations from the decisions that our more reptilian brain kind of made a moment earlier. And we’re really just rationalizing it. It turns out, if you want to really influence what people think and feel and do – in other words, leadership – you really need to speak to both parts of the brain. I’m not suggesting abandoning the rational, logical part of the brain at all. But you need to speak to both parts and bossing people around just doesn’t reach the other part of the brain. Stories have an ability to reach both parts. So that’s the main reason. Some other just practical reasons – stories make things easier to remember. You can remember a list of items or a significant set of facts if they’re embedded in a story much better than if you just give people a list of things to remember. It also travels better. People love to share a good story, and if you tell a great leadership story, then the people you tell it to will tell other people and they’ll tell people. But if you write a memo or an email that’s just a boring email or memo, it’s probably going to stay where you put it. It won’t travel on its own, and I think you want your leadership message to have that contagious nature that travels by word of mouth. The last one, which I’m just fascinated by, and I don’t know if you share this with your audience in some other podcast, but are you familiar with the Significant Objects project from back in 2009? Halelly: It’s not ringing a bell, no. Paul: These two guys, Rob Walker and Josh Glenn, just conducted this fascinating experiment. They bought 100 items at flea markets and garage sales, stuff like that. I think they spent $129 in total, so like $1.29 on average for just nothing. A wood cracker and a pink piggy bank, just the kind of things you’d find at a garage sale. They sold them all one at a time on eBay, but instead of – if you’re familiar with eBay – instead of having a picture of the item and a description of what it is, it has the picture of the item, but then they put a story with it. And they hired people to just write these stories and they were totally make believe. It’s clear in the story that this was totally make believe. This is not really a magical piggy bank or anything, but there’s no description. Just a short, interesting story that is about that item. And they ended up selling them for like $3,000 or $4,000. A thousand percent return on their money or whatever. I’m convinced it’s because it’s got a story with it. A story just really can make, whether it’s a product or a service or an idea, and just make it more valuable. Well, finally, the photographer walks over and so I get to ask him. I was like, “Dude, what’s with the pig in the ocean?” That’s when the magic started. He said, “Oh, yeah, that was the craziest thing. First of all, that picture was taken off the coast of this uninhabited island in the Bahamas called Big Major K,” and he said apparently what happened is a few years ago some local entrepreneurs started to raise a pig farm for bacon, I guess. He found out there was this uninhabited island where he could keep the pigs for free. He’s no idiot, so of course he’s going to keep them on the island for free. What he didn’t think about was that there wasn’t anything on the island for them to eat. There’s basically some cactus and a few other non-edible plants, but fortunately what happened was some local restaurant owner on a neighboring island was boating his kitchen refuse every night over to Big Major K and dumping it just a few dozen yards. So you can image these hungry little pigs, and if you get hungry enough, you’ll do anything, right? One little pig finally gets brave enough to dog paddle, or pig paddle, his way out into the ocean to get this food that’s floating out there, and then 2 pigs and 3 pigs, and here it is three generations later and all the pigs on Big Major K can swim. And he said, “That just made it so easy for me to get this picture, because I just leaned out of the boat and snapped the picture.” The pigs, when you boat over there, they think you’re the guy from the restaurant. They swim up to you. Anyway, at that point of course I’ve already got my credit card out and I’m like, “We’ll take it.” Think about why. Before he told me that story, it was just a stupid picture of a pig in the ocean. But after he told me the story, it was this wonderfully beautiful thing. It was a history lesson, a geography lesson, an animal psychology lesson all rolled into one and I had to have it. I love telling that story. Halelly: Exactly. When people come to your house and say, “What’s with the pig in the water?” And you tell them that story. Paul: I get to tell it again. Anyway, stories literally make things more valuable. Now it’s not just an idea or a product or a service. It’s a story that has the product or idea or service with it. Halelly: I love it. Listeners, I bet you have a picture in your head of what Paul’s bathroom photo of a pig in the water looks like, right? You have a picture in your head of the boat coming over and dumping the food. All of that is actually now so visual that it will stick. When you were describing the project, I recognized I had read about it and heard about it at some point. That is an amazing story. And one of the things I wanted for you to do today – we love to make the TalentGrow Show super actionable – and one of the things we’re going to talk about is how to craft a good story. But because you brought it up, I really want to talk a little more about this idea of when you say that you can get people’s emotions hooked before their rational brain kicks in, I know that some people think – and I actually do too – are concerned about are you manipulating people? Is this something that you’re doing to take advantage of people by trying to kind of appeal to some lower form of their consciousness and get them to do something that if they were thinking clearly and rationally, maybe they would think twice about? What do you say to that? Paul: First of all, that’s a very good thing to worry about. As a storyteller, you absolutely should worry about that. Let me back up by saying that first of all, storytelling is an art. So like music or photography or cinema, stories have the ability, in fact some people would say the obligation, to move your emotions. And another say of saying that is all of art is an emotion-manipulation device. Whether you’ve gone to the orchestra to see the symphony play Wagner’s “Ride of the Walkyries,” or you’ve gone to the theater to watch Shakespeare’s Romeo and Juliet, you’re expecting to be supremely emotionally manipulated. You’ve paid good money for the purpose of being emotionally manipulated. So that’s what art does. It emotionally moves people. When you’re telling a story, if you tell a good story, the same thing is going to happen. The key thing is, you want to make sure that emotional manipulation is welcomed by the audience. The people in that symphony orchestra hall and the theater want their emotions manipulated. If you’re telling some sappy story to con somebody into buying something they don’t need with money they don’t have, they probably don’t welcome that emotional manipulation, so the first thing you’ve got to make sure you’re doing is make sure your purpose in telling the story is to benefit the audience, and not you. If you’re trying to teach them a leadership lesson, or help them do their job better or help them understand the vision of the organization better so they can get on board with it and be successful in their career, those are good reasons to tell a story that will emotionally move people. But like I said, if you’re just trying to tell them something they don’t need and spend money they don’t have, then you’re really doing it for your benefit and not their benefit. So thing one is make sure your intent is in the right place. There’s some other things I think you can do to avoid emotionally manipulating your audience. So what we want is just to know your audience. Know where their threshold is for listening to the emotional-type stories. I learned this kind of the hard way by speaking to audiences all around the world. I can tell you that there’s a high tolerance for emotional content in stories in countries in Latin America. There is a lower tolerance for it in the U.S. and there’s an even lower tolerance in Europe. In Europe, the lowest one is in Germany. So you just need to know your audience and know where they’re going to be more accepting of and interesting in listening to your emotional content. A few other tips for avoiding that – another one is have emotional content, but not an emotional delivery. Meaning don’t do therapy on stage. You can tell a story about somebody crying, but if you start crying in front of your audience, you’ve gone too far. Now you’re doing theater or something and you’re not an actor. You’re a leader in a business and you’re having a conversation in a hallway or in the conference room. Don’t deliver your emotional content by behaving emotionally. Just tell the story and let the story do the work. Another one is, a lot of people turn their stories into videos. You’ll see a corporate video on this topic this month or another topic, or a corporate values video or a corporate vision video or whatever. Here’s my advice there – go easy on the music. Especially outside the U.S. or Latin America, because as soon as the sad, sappy, emotional music kicks in in the video, it immediately tells people, “You’re trying to make me cry. You’re trying to make me sad.” The artifice becomes so obvious that it’s off-putting to a lot of people. Just tell the story and let the story do the work, as opposed to adding these other visual and audio devices that are intentionally trying to raise the emotional content of the story. If it’s a good story, it will have emotional content that will be sufficient, but artificially generating more emotion in your audience with all these audio and visual cues often comes across as manipulative. Halelly: Interesting. We recently – I know you listened to it – we recently had an episode with Bob Burg where we talked about influencing and the difference between persuasion and manipulation. He goes into that in a lot more detail in that episode, if you’re interested. TalentGrowers, go check that out again. I definitely think that a word you haven’t mentioned but to me it seems like the differentiator, is integrity. Like you said intent. If your intent is to help them, Bob Burg talked about making it a win-win, and I’m thinking integrity. How will you feel about yourself if this was something that was on the cover of the New York Times or Washington Post? This is something ethical. Are you doing something that has an intent that is with an integrity and doesn’t somehow break your own code of values or the organization’s? The other thing that occurred to me also as you were speaking, we think about, we engage in experiencing stories all the time. You were talking about going to an opera or going to a play and we go to movies and we watch shows on TV, and those constantly put us in emotional states where we’re willingly temporarily suspending this belief and going into the story and we can even cry at some fictitious character and their troubles, right? So we get very emotionally wrapped up, willingly, when we listen to a story podcast or when we watch a movie. But as you said, in the business setting, we didn’t come prepared for that. That wasn’t our intention, so it sounds like in movies, yes, they have that music that kicks in and that’s on purpose and we give them Golden Globe awards for that music if it was really effective. But in business, that’s not what we’re about, so that’s taking it too far it sounds like? Paul: I think so. There’s actually one other little trick you can use to keep from emotionally manipulating your audience, and that is to provide what I call an emotional palette cleanser. What that is, it’s just some time in between when you tell some emotional story and the time your audience has to make a decision. If you tell, as one of your other guests called it, a tear-jerker story, and then immediately you follow that with, “Now, don’t you want to buy my product, or go off and do what I told you to do,” or whatever, that can make it feel more emotionally manipulative. You set me up emotionally and then you’ve immediately told me to go do something based on that. Give them 10 or 15 minutes and talk about anything else. That time just gives them a time for their emotions to calm back down and then they can make a rational choice. You’ll still get the benefit of the story, and even the emotion of the story, but it won’t feel like, “Oh, gosh, you just told me to just get me to do this.” As opposed to this is one piece of information. I want you to process it, but then settle back down and make a rational choice about what you’re going to do now. Give them the time to do that and it won’t be manipulative and it won’t feel manipulative. Halelly: Interesting. I like that. So since we’re kind of in the technique and thinking about steps, and you just gave us the palette cleanser that’s after the story, let’s break down a little more about the before, during and after. What are the components or the important structural elements of a great story? How do you teach about this? I mean, listeners, you’ve got to go read the book and Paul, we’ll link to his website. He has lots of resources on there as well, so there’s nothing we can do in this 30-minute format to give you everything that he has to share, but I know that Paul is going to share something super-useful here. Paul: I used to try and talk people through the stages of a story, the context, the challenge, the conflict and resolution. But what I’ve found is, what’s easier for people to wrap their minds around and therefore easier to remember and more helpful, is just a list of the questions that your story needs to answer and the order in which it should answer them. I think there are eight. Here are the eight questions I think your story should answer and the order in which they should answer them. First, why should I listen to the story? That’s the first question you have to answer for your audience. If you don’t answer that question well, they may mentally, emotionally or physically walk away, and not be listening to your story. In the first few seconds, you have to give them a reason to bother to continue to listen to you for the next two or three minutes while you tell the story. That’s number one. But then you get into what I think are some fairly reasonable, typical stages in a story. You have to answer where and when did it take place? Number three, who is the main character and what did they want? Number four, what was the problem or opportunity they ran into? Number five, what did they do about it? Number six, how did it turn out in the end? Those I hope will sound like they make sense. Where did it take place, who is the main character, what did they run into, what did they do about it and how did it turn out in the end? That’s technically the end of the story, but you’ll notice there are still two more questions, which is what helps you accomplish your leadership objects, because question number seven is what did you learn from the story? Number eight is what do you think I should go do now? That’s your opportunity to recommend some action. If you answer those eight questions in that order, you’re guaranteed to have I think a decent story. There are other things we can do with surprise and dialogue and emotion and details and things like that to turn it into a great story, but this is the core, having the right structure and the right information in it and the right order, and the reason order is important, by the way, is that if you skip for example, question number two – when and where did it take place – I’ll test this out on you. If I tell you a story about last summer at Coney Island with my wife at the art fair looking for a picture for our kids’ bathroom, what do you assume about the story? Paul: Exactly, that it’s a true story. If I start out, “Once upon a time, in a land far away,” of course you assume it’s not a true story. But what if I don’t do either of those things? You don’t know. You don’t know if it’s a true story or not, and throughout the rest of the story, especially if it’s a fascinating story, you’re thinking more and more that it’s not true. In fact, what your audience will do, they’ll be like, “Come on, Halelly. Did this really happen? Where was this? When did this happen?” They will actually ask you question number two, the more incredible the story gets. And that’s our human way of trying to figure out if it’s true or not. You could start your story saying, “This is a true story,” but that’s kind of stilly and awkward. If you tell them when and where it happened, it communicates that, look, this is a real story. I’ve got all the details, know exactly when and where it happened. And if you don’t answer that, that nags at your audience, and they don’t listen to the rest of your story as well as they would if you answered that up front. So, this order is for a reason. This is not just random. These are the eight questions I think your story should answer and the order in which it should answer them to have your best odds of having a compelling leadership story. Halelly: Awesome. I love it. We’ll list them in the show notes, so if you want to take notes and maybe you’re driving now or running on the treadmill or I don’t know, what do you do when you listen to my podcast? I really want to know. Please don’t have an accident. We’ll list them on the show notes. Just go there and grab that. I wish we had a lot more time, but it’s time to start wrapping up. Before you give us one specific actionable tip for listeners, Paul, what’s new and exciting on your horizon these days? Paul: I just, last month, did something I’ve never done before. I actually signed two new publishing contracts, so I find myself writing two books this summer. One may sound kind of out of left field for somebody in my line of work, but I’m writing a biography about a cognitively impaired deaf man and his fascinating journey through life. And at the same time, I’m writing my next kind of business book on leadership, storytelling, that’s just going to summarize the 10 most important stories that I think great leaders need to tell. So I’m definitely working both my left and right brains this summer. Halelly: Wow. I’m very curious to know why you chose to write two books at once, because it sounds a little bonkers. Paul: That wasn’t intentional. Life kind of worked out that way. Paul: Exactly. That’s what happened. Halelly: I look forward to hearing more about those and of course reading them when they’re out. What’s one specific action that you recommend our listeners take today, this week, that you think can upgrade their leadership storytelling skills? 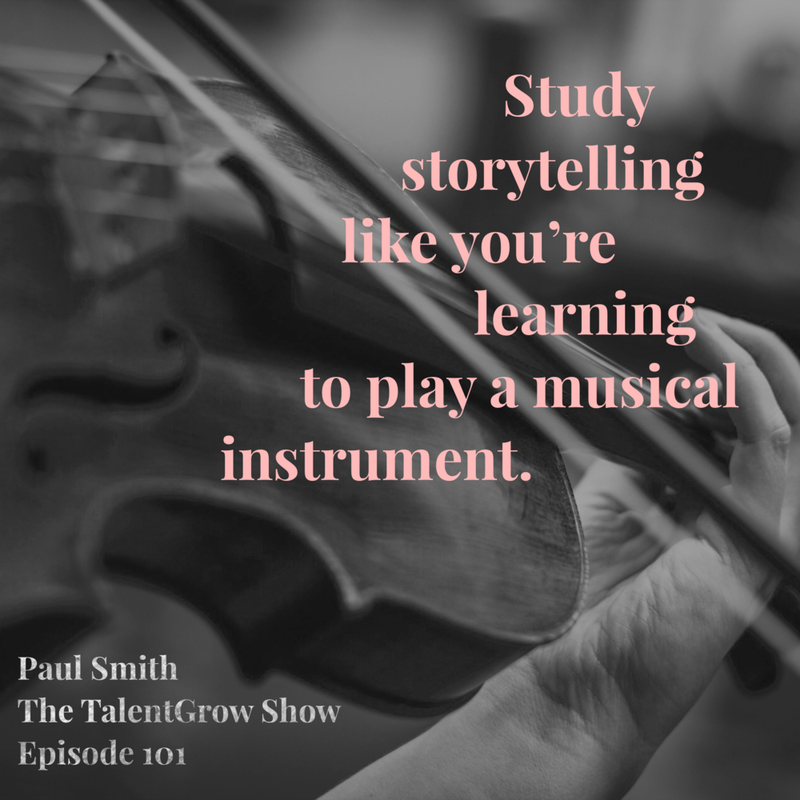 Paul: I would say study storytelling like you were learning to play a musical instrument. I say that because as we talked about earlier on, a lot of people just assume that it’s not. It’s not the kind of thing that I could or should learn. That’s the kind of thing you’re either born with or you’re never any good at. I think that’s not true. It’s like I said, learning to play the guitar. Pretend it is a musical or artistic talent that you want to learn, and then go figure out a way to learn that. The way you would anything else. Take a class, read a book, study it from an expert, and I think you’ll do far better than just winging it. Halelly: Great advice for anything. Great! How can people maybe if they choose to learn from you or they want to follow up with you and learn more about what you do and from you, where would they do that? What would be the best place? Paul: Probably the best way is my website, which is LeadWithAStory.com. Links there to my books and training courses and just about everything of interest around me. Halelly: Great. Do you hang out on social media? Should they follow you anywhere? Paul: I do. LeadWithAStory is my Twitter handle as well. You can probably find me on LinkedIn that way and Facebook as well. Halelly: Great, we’ll link to that in the show notes. Paul, we’re really glad that you came by on the TalentGrow Show to share some of your thoughts with us and your story. I know that listeners will go and check out your content and learn more from you. Thank you for your time today. Paul: You’re very welcome. Thanks for having me. Halelly: My pleasure. Well, you’ve made it to the end of the podcast club, as David Burkes, my former guest, described it. I’m glad you’re still here with me and I hope that you enjoyed this episode with Paul Smith and that you’ll take that action that he suggests and think about it like you’re going to study how to play a musical instrument. You wouldn’t expect to just be good at it instantly. You wouldn’t think that you are either born knowing how to do it or not, but that it’s something you need to practice in a purposeful and mindful way, like any other skill. I hope that you’ll pursue storytelling as a leadership skill. That’s what I’ve been trying to bring to you here in this episode and also in episode 91 that was with Ryan Williams, also about storytelling, which I hope that you’ll check out if you haven’t already. And, I look forward to hearing your feedback about what you liked about this episode, what you thought about it, any kind of stories you can share with me about times when you’ve used stories successfully, or any questions that you have from me and/or for Paul. That would be great. You can put that in the show notes comments page on TalentGrow.com/podcast/episode101. Or you can tweet at me or send me a message through any form of social media. You know that I hang out there, and of course you know that I’ve got that little voicemail tab on my website on the right that you can easily send me a voice recording of you, telling me a comment, giving me feedback or asking a question. If you give me permission, I can even play it on the air. Let’s do it. That’s it for another episode of the TalentGrow Show. I’m Halelly Azulay, your leadership development strategist here at TalentGrow, and until the next time, make today great.